As time goes on I find I'm getting braver and more overt with my drops. This morning for instance, I left a heart with only a minute and a half to spare before catching a bus home. 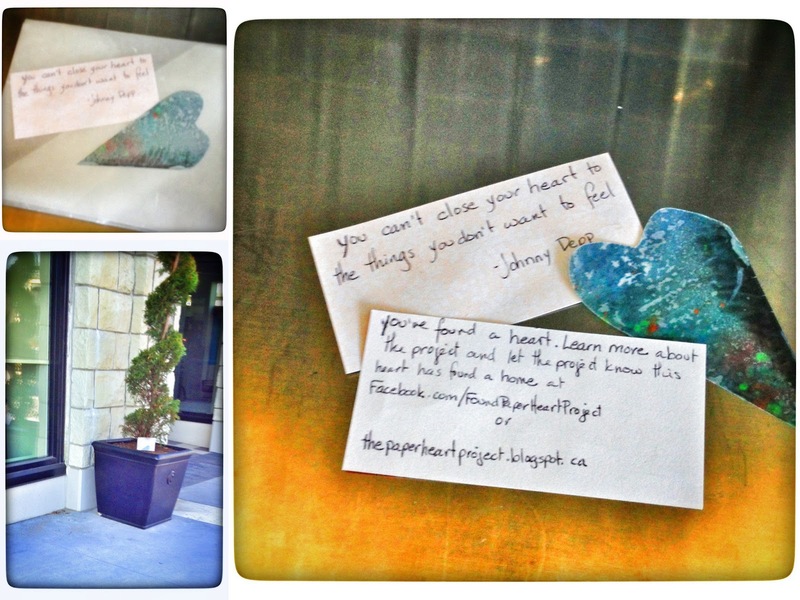 The drop was left near by the last drop, in a planter outside of a chocolatier with two ladies sitting in the window enjoying coffee and croissants right in front of where I placed the envelope. Whether these ladies noticed the drop is really something I didn't pay attention to beyond noticing they were there. If nothing else they may have noticed the Bean (my youngest sprout) in my arms as I placed the heart beneath the topiary. She (the Bean) has got cheeks that don't end and they tend to attract attention. I placed the heart, took a few photos and walked quickly away to catch the bus home. All directly in front of the two customers and without heart pounding anxiety. On the one hand I like the idea of anonymity in the interaction of finding the heart. On the other, I wonder if seeing someone doing something a little out of the ordinary; like carefully placing an envelope in a planter, on a bench or inside a dairy case before taking a few photographs and walking away; will invite a closer look at that envelope? After the April 16 drop and the near witness of a finding, Being a little more obtrusive in the act of a drop feels easier to do. While the motivation for this project is to leave these positive messages and hearts behind to be found I can't deny that a little feedback, even as small as the idea that someone has seen the act is reinforcement to continue on. So the project is evolving.